Tonight, I saw the film The Painted Veil, based on W. Somerset Maugham's 1925 novel. 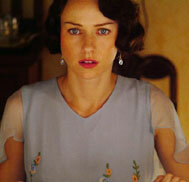 The story is of an independent-minded woman, Kitty (Naomi Watts), in mid-1920s England. 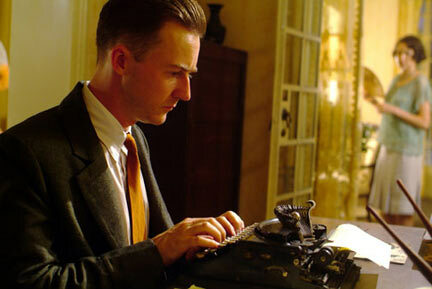 Her family is anxious to marry her off, and she finds herself with Dr. Walter Fane (Edward Norton), M.D. and presumably Ph.D., researcher of infectious diseases. 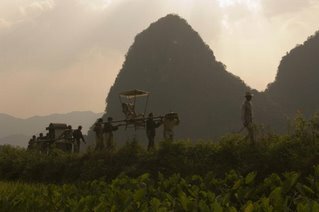 He takes her to Shanghai and then the remote village Mei-tan-fu in Guangxi in the interior of China, where he has volunteered to help, without even asking Kitty, to help combat a deadly cholera epidemic. The story is one of marriage to a man so focused on his research that he only speaks when something needs to be said, a passionless relationship that almost formulaically leads to extra-marital passion. Almost as penance, Walter announces that they are going to a place that Kitty feels no (English) woman belongs, without, it seems, regard to Kitty's interests or well-being. The stark choice is to face shameful divorce or join in; when Charlie Townsend (Liev Schreiber) all too predictably declines to leave his wife and marry his love, Kitty, there seems to be no choice at all. Despite strong performances, particularly by Naomi Watts, a pleasant appearance by Diana Rigg as a nun in charge of an orphanage, gorgeous scenery, and strong expectations to like what I thought would be a romantic period film like many films I have seen and enjoyed (such as Merchant Ivory Productions' 1992 Howards End or 1985 A Room with a View), I wasn't so enamored by The Painted Veil. I thought that the story was rather predictable. Walter, I found, was unrealistically coldly detached, and Kitty bore the cross of her predicament in a manner that didn't seem consistent with her pre-marital characterization. Their relationship never made sense to me, though at the beginning I was able to see it as a pressure-imposed one. Dr. Fane's almost total self-absorption and lack of sensitivity (such as initially banning all of the villager's sources of water without considering how they would drink - not much of a boon to the community or a cogent public health approach) further hardened and distanced his characterization. Clearly there was Dr. Fane's attitude, but in general there was little plot development about anti-colonialistic resentment of the Chinese toward the English - precious little to appropriately set the stage for elements key to the story. More could have effectively been done, I think, without using up much time. Much as Kitty's character is developed reasonably well, with few exceptions (such as slightly eccentric neighbor Waddington played by Toby Jones), the other characters are relatively flat. Though I was a little disappointed, the scenery and its portrayal was fabulous. Kitty's spirit and the scenes in the orphanage provided much needed respite from the stern, unsharing Walter. I am not at all averse, and in fact generally quite like, romantic period pieces (if this film can be called "romantic"), and, based on other reviews I had seen, quite expect many others to enjoy The Painted Veil more than I did. I do recommend for those that those who want to see it to see it while it's on the big screen; the impact of the mountains, rice fields, and landscapes in general needs to be appreciated in the large. In addition to the imdb page on the film, you can visit the Warner Independent Pictures official film site. Also, the trailer follows below.